The "Greatest Snow on Earth"! 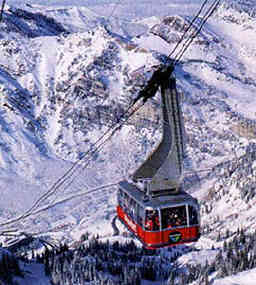 Located just 40 minutes (29 miles) from the Salt Lake City airport Snowbird Ski Resort offers an unparalleled world-class mountain and luxurious accommodations. Convenient on-demand van service to and from the airport makes a car strictly optional. Click the link above for a full description of the amenities and activities available at this complete mountain village. 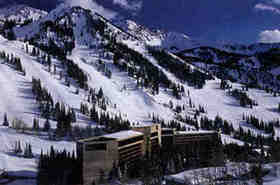 The Cliff Club - slopeside/ ski in, ski out. Hot tub located on private balcony. 3 oversized rooms ( 1368 sq. ft.). 2 bedrooms, each featuring a mini-kitchen (wet bar, microwave oven, refridgerator), king bed, double sleeper sofa, full bath and private balcony. 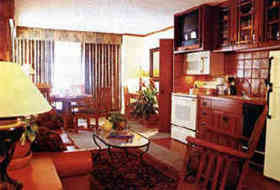 Center studio-room with living / dining / sleeping areas, full bath and a full kitchen. Custom Mission-style furnishings, original oil paintings, hand-made oriental carpets. Premuim leather double sofa beds in each room. 27 inch TV with VCR in each room. Unit sleeps up to 10 people. Full privileges at the world-class, full-service Cliff Spa and Salon. Available in whole or in part (see "Terms" below). Weekend (Friday thru Sunday). $800 per night (3 night minimum). Weekdays (Monday thru Thursday). $650 per night (4 night minimum). Center unit and one bedroom. Weekend (Friday - Sunday). $600 per night (3 night minimum). Weekdays ( Monday - Thursday). 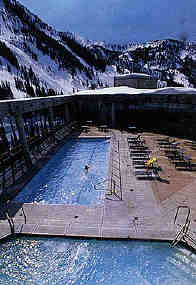 $425 per night (4 night minimum). Weekend (Friday - Sunday). $303 per nite (3 night minimum). Weekdays ( Monday - Thursday). 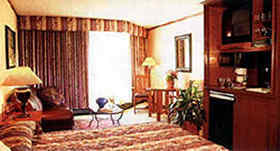 $255 per night (4 night minimum). 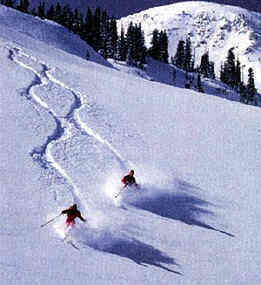 Call or email for week availability and 25% discount pricingide/ ski in, ski out. A deposit of one-half of the rental amount is required to hold a reservation. Full payment required no later than 60 days prior to arrival. The deposit will be forfeited if full payment is not received by 60 days prior and the unit will be made available for rent again. Cancellation policy: one-half of the deposit ( 1/4 of the rental amount) will be forfeited if cancellation recieved 60 - 30 days prior to check-in; 1/2 the rental amount if cancellation recieved 30 - 15 days prior to check-in; full payment is forfeited if cancellation recieved 14 days (or less) prior to check-in.